Red lights blazing, the hero of the Welsh Valleys arrives at the scene of destruction. Any normal person would baulk at the intensity of the moment but our man astonishes the populace by flinging himself into the most perilous of situations. Most importantly, we can all be assured that everything will be resolved by teatime and calm will be restored across the beautiful hills after his quick thinking has saved the day. Unfortunately for Labour moderates, I am not referring to their new-found saviour from Barry, Owen Smith. Rather, I am referring to the principled and courageous figure that is Fireman Sam. However, it has been thoroughly circulated around the social media world that Sam has found himself in a spot of bother this week. Within an episode first shown in 2014, Sam is seen to slip on a pile of papers which proceed to fly up into the air. As one piece briefly hovers over the screen, an extract from the Koran can be seen. In the minds of most ordinary people, this is a rather bizarre but faintly amusing situation, and there would be nothing gained from reading into the editing of a Children’s Television stalwart. Nevertheless, the politically correct epidemic that is the 21st Century continues to astonish. Accusations of Islamophobia were vented at the animators and criticism was spoken from the highest offices of the Muslim Council of Britain. 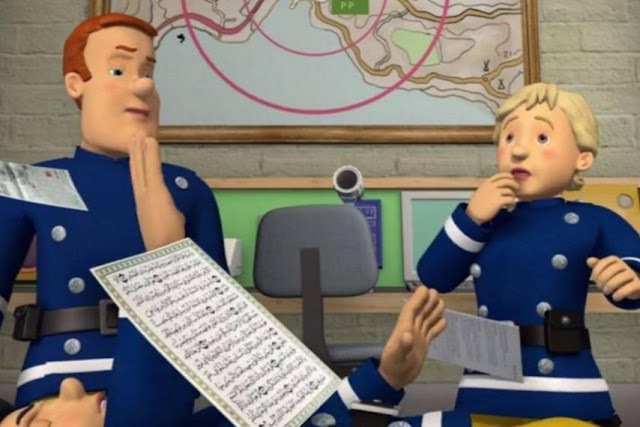 Despite not having shown Fireman Sam on their channels for almost a decade, the BBC received over a thousand complaints. This hostile response to such an insignificant event highlights the inconsistencies in the British public’s approach to religion in the modern era. We are very quick to defend minority religions but are we so quick to discuss their influence or question their teachings? It isn’t just the British public that contribute to this religion taboo. Indeed, the leader of the Catholic World indulged in a little bit of quasi-apologism today by stating that the slaughter of a priest in France had nothing to do with religion; rather it was all connected to “interests, money and resources”. This is the paradox that the Western World has created for itself. We all denounce ISIS and lobby for the annihilation of it’s very being but we cannot fully achieve that unless we tackle the roots that lead to its creation. Just as the Christian World underwent a transformational enlightenment that initiated a widespread acceptance of the natural sciences, so too does the Islamic Sphere require a revolutionary transitional period. It is the responsibility of Western politicians not to ignore Islam and it’s two billion followers, but to lobby for dosages of liberalism into a religion that has largely failed to modernise over the past few centuries. UK politicians have been all too guilty of failing to gather the opinions of the hundreds of thousands of liberal Muslims across our country. Instead, they have continued to be influenced by the ultra-conservative Muslim community leaders, who are traditionally homophobic and sexist (not too distant from our Anglican leaders a few years ago). It is heavily disturbing irony that the Government that introduced Gay Marriage has failed to eradicate the patriarchal and bigoted attitudes prevalent in some of our inner-city communities. Indeed, it is apparently the socially liberal option to accept these beliefs for what they are; after all they are an expression of a different culture. But is it right to accept discrimination as long as it is done in the name of a minority religion? Or should we not seek to spread liberalism and tolerance into all corners of our country, and the globe? Stoking the hideous beliefs of ISIS is the socially conservative baseline of many quarters of the Islamic world. Thus, Daesh can never truly be defeated unless we tackle the anti-liberalism that is continuing to dominate mosques across the Middle East, and even in our own cities. We can all refer to the terrifying effects of failing to make the case for tolerance in the past, and it is easy to predict that failure in the future will result in an explosion of fascistic terrorism. Terrorism that is carried out in the name of God. Religion is defended with such vitriol that we are failing to appreciate the basic link between dog-whistle bigotry and the alarming rise of ISIS attacks across the world. Nobody should fear questioning beliefs or the institutions that encourage those beliefs. Nobody should fear discussing religion in the open world we are in. Nobody should consider religion to be the great unspeakable subject. It’s time we talked God. It is time we drive the fire-truck of liberalism and put out the fires of hatred.